Real-time bidding (RTB) is faster-than-fast bidding. In fact, advertisers can bid in RTB auctions faster than your brain can process visual information—within-a-few-hundred-milliseconds fast. Magicians, for example, exploit this shortcoming of the human brain with sleights of hand and other motions to create the visual illusions in their tricks. After magicians perform such tricks, people most commonly ask them, “How the heck did you do that? !” It’s safe to say that advertising pros reacted the same way when they saw the magic of a programmatic auction for the first time. 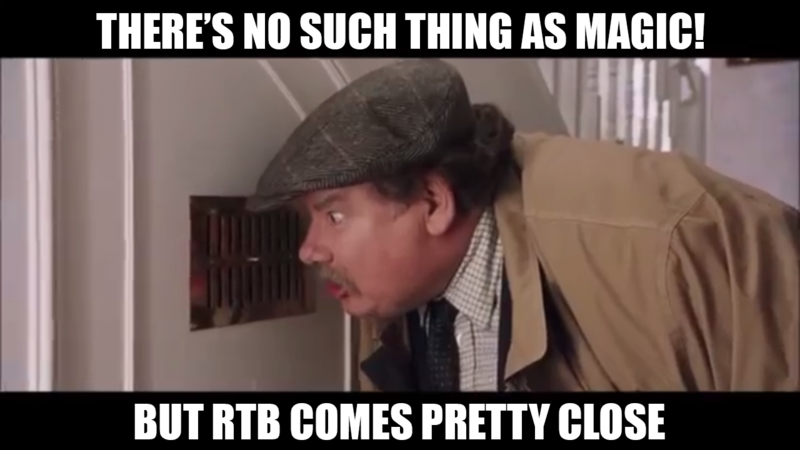 Definition of RTB: RTB facilitates the buying and selling of an individual ad impression in real time via an auction mechanism and occurs in a split-second before the ad is served. Definition of an auction: An auction is a process where potential bidders submit bids on a good, followed by an auctioneer who screens all of the bids and awards the good to the highest bidder. Ad exchanges and supply-side platforms (SSP) aggregate multiple demand-side platforms (DSP) to balance the supply and demand in such marketplaces, using auctions—second-price auctions in particular (more on that later)—to sell ad impressions in real time. But let’s pause for a moment. Before we go any further, it’s important to note that most, if not all, of these advancements have only affected the ad space on desktop and mobile web. In the mobile game and app space, the vast majority of advertising and publishing isn’t bought and sold in real time. Many of the leading mobile ad networks still handle end-to-end ad delivery for both advertisers and publishers, albeit not in real time. If you’re trying to make sense out of all this chaos, then you’re in the right place. Now, magicians have an unwritten code to never explain the magic behind tricks and illusions. Fortunately for you, the Fyber Blog doesn’t follow such rules. 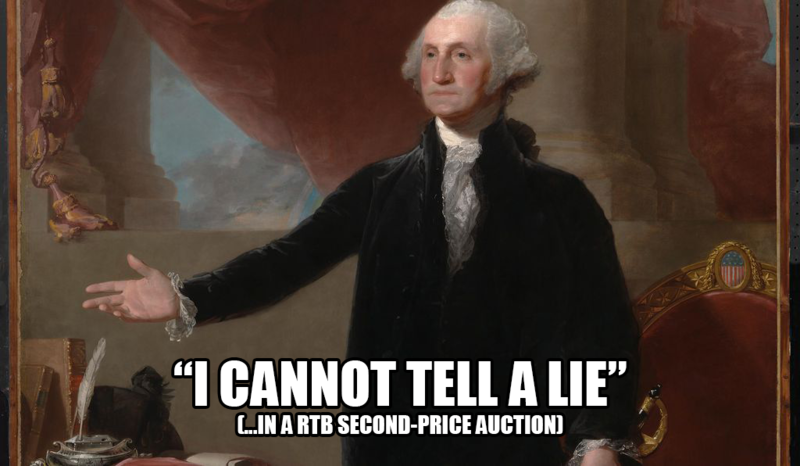 Here, we’ll share the mechanisms of second-price auctions in RTB, why truth-telling is a dominant strategy in second-price auctions, and how header bidding is blurring the lines among auction types. A second-price auction is an auction where the highest bidder wins, but pays a price equal to second-highest bid. Outcome: Advertiser C (who bid $12 CPM) would win the auction, but only pay the second-highest price of $10 (Advertiser A’s bid). Yes, but RTB adds one wrinkle: The winning advertiser would pay the second-highest price plus a predetermined amount, in most RTB auctions that would be one cent. Watch this video below by computer science professor Kevin Leyton-Brown from the University of British Columbia for more information on bidding in second-price auctions. Note: Each advertiser’s valuation of the ad impression is private, as it relies on the direct sales or campaign budget, which is only known by advertisers themselves. Auction winner: Advertiser C would win the auction, clearing the auction at $10.01, in other words, the second-highest bid (Advertiser A’s bid of $10 CPM) plus one cent. What does this mean for mobile game and app advertisers and publishers? Programmatic RTB mainly employs the impression-based CPM pricing model. The same way math is considered the universal language of the world, CPM is the universal language of the RTB world. In the mobile in-app ad tech industry, cost per install (CPI) and other performance-based advertising pricing models rule the land. How should advertisers bid in a second-price auction? An auction, as a mechanism for finding a market-clearing price, creates competition among advertisers. In turn, advertisers are incentivized to reveal their private valuations when placing their bids. Therefore, truth-telling is a dominant strategy in a second-price auction. In other words, the right thing for advertisers to do in a second-price auction setting is to tell the truth, as in their maximum willingness to pay for an ad impression, by bidding exactly at their private value. Definition of dominant strategy: When one strategy is better than another strategy for one bidder, irrespective of how other bidders may bid. The truth-telling property derives from the traditional second-price auction and the widely adopted Vickrey-Clarke-Groves (VCG) auctions seen in search advertising, according to research published in the paper “Internet Advertising and the Generalized Second Price Auction: Selling Billions of Dollars Worth of Keywords” by associate professor of business administration Benjamin Edelman at Harvard University. Advertisers typically join a second-price auction with a predetermined budget and run ad campaigns for a fixed amount of time, over which they participate in a huge volume of auctions. According to research published in “Competition and Yield Optimization in Ad Exchanges” by assistant professor of business Santiago Balseiro at Columbia University, truth-telling might not be a dominant strategy for advertisers in second-price auctions. In his research paper, Balseiro argued that in repeated second-price auctions, advertisers shade their bids to account for the option value of future auction opportunities. Further, Balseiro stated that because budget constraints factor into advertisers’ decisions over time, then the auction dynamic does not reduce to a sequence of static auctions. Definition of bid shading: Bid shading is the act of a bidder placing a bid that is below their true private valuation of what they believe a good, in this case an ad impression, is worth. The shading of bids is part of Balseiro’s Fluid Mean Field Equilibrium strategy, which states that if budgets are large for advertisers in a second-price auction, then in equilibrium advertisers will bid truthfully. If budgets are tight, however, then advertisers will shade their bids in equilibrium. The introduction of header bidding has turned second-price auctions on its head. Essentially, the header bidding method typically employs the second-price auction model. In a common ad setup with header bidding, the winning bid from the header bidding auction would be sent to an ad server such as Google’s DoubleClick for Publishers (DFP), where another second-price auction (or, possibly, first-price auction) would occur. As a result, the winning bid from the header bidding auction would have a significantly lower chance to win the final auction. This “layering” of auctions is what’s creating major headache and confusion for the digital advertising industry on desktop and web. Header bidding isn’t all to blame, nor is the second-price model. In our next blog post, we’ll reveal that perception isn’t always reality. We’ll shed light on the contentious chatter surrounding second-price auctions in the programmatic industry, separating fact from fiction.